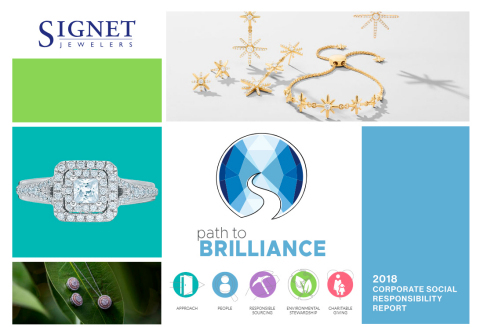 Signet Jewelers Limited ("Signet") (NYSE: SIG), the world's largest retailer of diamond jewelry, today released its 2018 Corporate Social Responsibility (CSR (News - Alert)) report that highlights the Company's global CSR initiatives. The report includes Signet's progress toward goals set across its four CSR key areas: People, Responsible Sourcing, Environmental Stewardship and Charitable Giving. For the first time, the company produced an integrated CSR report with its annual report, streamlining the way Signet communicates with stakeholders and investors. "At Signet, we know that our sphere of influence goes beyond just the places we do business," said Virginia C. Drosos, Chief Executive Officer. "We recognize that our people, values and culture require that we take responsibility wherever we have an impact. Instilling trust among our key stakeholders - investors, employees and customers - means that we are transparent about our CSR goals, and that we must integrate them into our daily operations." Signet is committed to leading in CSR in an authentic and sustainable way. For example, Signet is one of very few public companies to have a Board-level CSR Committee, which has been in place for five years. The Committee provides strategic direction and governance oversight on goals and progress for Signet's four CSR key areas. "The Board CSR Committee believes that our CSR commitment clearly supports the company's business strategy for long-term growth," said Eugenia Ulasewicz, Signet Board Member and Chair of the Board CSR Committee. "CSR is central to our culture, reflected in our core values, and essential for us to remain both an industry leader and a competitive company." 74 percent of Signet's field leadership are women. Signet is the first retailer to join De Beers' innovative new blockchain program, Tracr. The program aims to establish a unique and completely secure way to trace diamonds. Water consumption was lowered by more than 60 percent at Signet's factory in water-scarce Botswana. Sinc 1999, Signet customers and team members have raised more than $71 million to support the lifesaving mission of St. Jude Children's Research Hospital®. Signet's full 2018 CSR Report can be found at: CSR Report and its Annual Report is available at this link: Annual Report. This release contains statements which are forward-looking statements within the meaning of the Private Securities Litigation Reform Act of 1995. These statements, based upon management's beliefs and expectations as well as on assumptions made by and data currently available to management, appear in a number of places throughout this document and include statements regarding, among other things, Signet's results of operation, financial condition, liquidity, prospects, growth, strategies and the industry in which Signet operates. The use of the words "expects," "intends," "anticipates," "estimates," "predicts," "believes," "should," "potential," "may," "forecast," "objective," "plan," or "target," and other similar expressions are intended to identify forward-looking statements. These forward-looking statements are not guarantees of future performance and are subject to a number of risks and uncertainties, including, but not limited to: our ability to implement Signet's transformation initiative; the effect of US federal tax reform and adjustments relating to such impact on the completion of our quarterly and year-end financial statements; changes in interpretation or assumptions, and/or updated regulatory guidance regarding the US federal tax reform; the benefits and outsourcing of the credit portfolio sale including technology disruptions, future financial results and operating results; deterioration in the performance of individual businesses or of the company's market value relative to its book value, resulting in impairments of fixed assets or intangible assets or other adverse financial consequences, including tax consequences related thereto, especially in view of the company's recent market valuation; our ability to successfully integrate Zale Corporation and R2Net's operations and to realize synergies from the Zale and R2Net transactions; general economic conditions; potential regulatory changes, global economic conditions or other developments related to the United Kingdom's announced intention to negotiate a formal exit from the European Union; a decline in consumer spending or deterioration in consumer financial position; the merchandising, pricing and inventory policies followed by Signet; Signet's relationships with suppliers and ability to obtain merchandise that customers wish to purchase; the reputation of Signet and its banners; the level of competition and promotional activity in the jewelry sector; the cost and availability of diamonds, gold and other precious metals; changes in the supply and consumer acceptance of gem quality lab created diamonds; regulations relating to customer credit; seasonality of Signet's business; the success of recent changes in Signet's executive management team; the performance of and ability to recruit, train, motivate and retain qualified sales associates; the impact of weather-related incidents on Signet's business, financial market risks; exchange rate fluctuations; changes in Signet's credit rating; changes in consumer attitudes regarding jewelry; management of social, ethical and environmental risks; the development and maintenance of Signet's OmniChannel retailing; the ability to optimize Signet's real estate footprint; security breaches and other disruptions to Signet's information technology infrastructure and databases, inadequacy in and disruptions to internal controls and systems; changes in assumptions used in making accounting estimates relating to items such as credit outsourcing fees, extended service plans and pensions; risks related to Signet being a Bermuda corporation; the impact of the acquisition of Zale Corporation on relationships, including with employees, suppliers, customers and competitors; Signet's ability to protect its intellectual property; changes in taxation benefits, rules or practices in the US and jurisdictions in which Signet's subsidiaries are incorporated, including developments related to the tax treatment of companies engaged in Internet commerce; and an adverse development in legal or regulatory proceedings or tax matters, any new regulatory initiatives or investigations, and ongoing compliance with regulations and any consent orders or other legal or regulatory decisions. For a discussion of these and other risks and uncertainties which could cause actual results to differ materially from those expressed in any forward-looking statement, see the "Risk Factors" section of Signet's Fiscal 2019 Annual Report on Form 10-K filed with the SEC (News - Alert) on April 3, 2019 and quarterly reports on Form 10-Q filed with the SEC. Signet undertakes no obligation to update or revise any forward-looking statements to reflect subsequent events or circumstances, except as required by law.